Stone imbued with the power of the dragons. Rite of apostles of the ancient dragons. Gain head of dragon. Emit dragon breath. step, but it cannot be reversed until death. 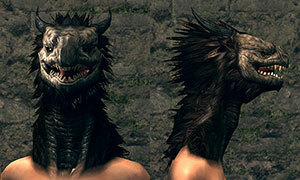 First time use on normal condition, your head will take the appearance of a dragon's head. You can't equip any head gear. It lasts until you die. When your head has been transformed, assigning the Dragon Head Stone to your quick access bar and holding the Use button will make you spew gouts of dragon fire at the cost of stamina. The fire's power is directly related to the player's soul level and Path of the Dragon covenant level. Raise covenant level by offering Dragon Scales to the Stone Dragon at Ash Lake. You can still use Dragon Head Stone even after you leave the covenant, but its fire power will be severely reduced as your covenant level is lowered. Effective use entails firing short gouts of flame, being careful to not empty your stamina completely. Does not work if you have the Parasite Egg infection.